These Taiwanese-style meatballs call be added to a variety of recipes and used in many ways, such as in soups, in a hot pot meal, as part of a casserole or as a stir fry dish with vegetables. Mix the ingredients in Part A together with a folk or spatula and stir in the same direction (e.g., clockwise) until the mixture is well blended, approximately three to four minutes. Add the ingredients in Part B, then stir until well-mixed. Store this mixture in the refrigerator for two to three hours. After the chicken mixture has been chilled, heat a pot of water to boil, then turn the heat to low. 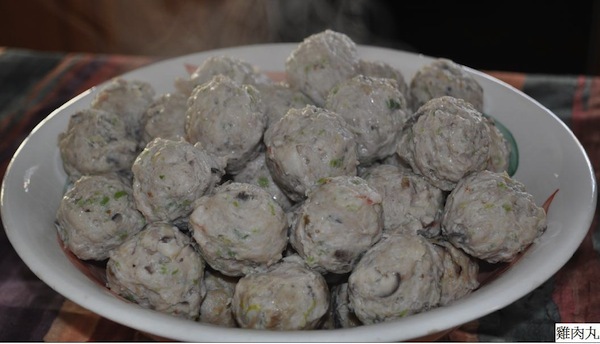 Shape the chicken mixture into meatballs of 1 to 1 1/4 inch diameter by using your hands (you can wear gloves). You can do this by putting some of the mixture in your palm, then squeezing the mixture through your thumb and index finger. Scoop out the meatball by using the spoon and immediately place the meatball into hot water to cook. Place the spoon back in the water bowl and repeat the process to make more meat balls. Once the meat balls have floated to the surface of the pot, cook in boiling water for two more minutes, then use strainer to remove the cooked meatballs. To save time, you can make extra meatballs in advance and store them in the freezer for future use.